Well, this seems to happening more and more frequently. Samsung and HTC have been banned from Futuremark’s Scores because the giants were caught rigging benchmark tests. The current status of the ban can be checked here. 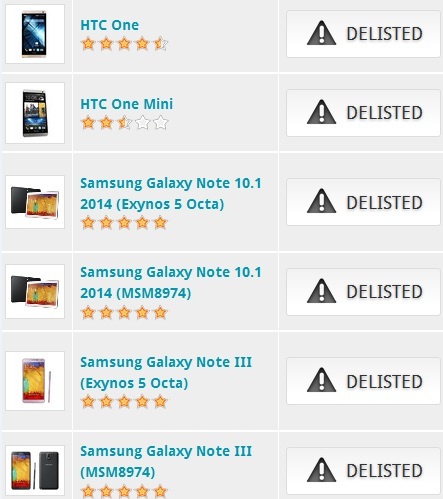 At the time of writing certain high end Samsung and HTC devices have been blacklisted. Futuremark takes action against Benchmark Rigging – Samsung and HTC Devices banned in the process. So heres what happened. Apparently the new bath of Samsung and HTC devices were rigged to give a bloated benchmark score. They managed this by a hidden code overclocking and removing any throttling to the CPU and GPU as soon as a known benchmarking program was detected. The result? Scores started increasing by around 20%, naturally this is not an accurate representation of the phones capability since you cannot run a CPU GPU, overclocked and throttled due to overheating and other complications. Also the same performance would NOT be available to the user while running Games and Applications. Thus the power was reserved solely for benchmark rigging. “People rely on Futuremark benchmarks to produce accurate and unbiased results. That’s why we have clear rules for hardware manufacturers and software developers that specify how a platform can interact with our benchmark software,” Futuremark President Oliver Baltuch said in a statement. “In simple terms, a device must run our benchmarks without modification as if they were any other application.” Source – VRZone.